It was a fantastic day to go for a walk at lunchtime. This was taken on Park Avenue South just north of 14th Street. 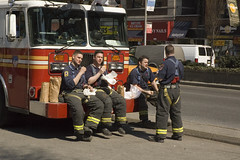 I'm glad these Firefighters were enjoying the Day. As you can see, they're dressed and ready in the event that their needed. The Union Square Park was packed with people coming out for lunch. It was at least in the upper 60's and hundreds of people were out in Union Square and Washington Square park just hanging out. Hope tomorrow is just as nice. Posted Via my Flickr account. "General Attitude" by Collective Soul from the "Youth" Album. Notre-Dame Flames Spread Like Wildfire. Here’s Why. Is This the End of the Line for Nationalism in Australia?